Minister of Social Services and Urban Development, the Hon. 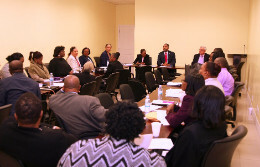 Frankie Campbell, recently met with Heads of the various Departments and Divisions that fall under the auspices of the Ministry, to chart the course for the new year. The continuous improvement in the delivery of services to clients, in addition to enhanced communication (both internally and externally), were among the key matters addressed during the meeting.